Comes with a free game, too. Have you been waiting for the right deal to come along before upgrading your graphics card to a GeForce GTX 1080, the second best Nvidia has to offer (behind the Titan X)? If that's the case, now might be the time to pull the trigger. 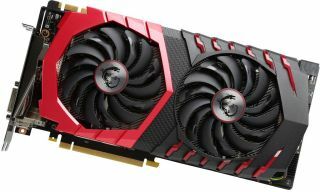 For the next seven days, Newegg is offering the MSI GeForce GTX 1080 Gaming X 8G on sale for $620, which is $70 below its normal selling price. There's also a $25 mail-in-rebate available that brings the total cost down to $595. Now is a good time to be in the market for a GeForce GTX 1080 or 1070, whether it's this specific card or a different one. Nvidia is running a "Prepare for Battle" promotion where you can claim a free game with the purchase of either card, or a system or a laptop with one of those GPUs. You can choose between For Honor, which comes out February 14, or Ghost Recon Wildlands, which arrives on March 7. There is also a high resolution texture pack for Fallout 4 arriving next week for PC, and you'll need a strong setup to run it. Bethesda recommends nothing less powerful than a GeForce GTX 1080, along with an Intel Core i7-5820K or faster processor and at least 8GB of system RAM. The card's cooling fans don't kick on until the card's temps rise above 60C. Cooling is further aided by 8mm thick copper heat pipes with a smooth square shape at the bottom, a solid baseplate, and what MSI claims is premium thermal compound. Go here to grab the card on sale, and don't forget to redeem your free game.